Since tomorrow is Thanksgiving, I thought it would be fun to shake up Wedding Cake Wednesday by sharing a recipe for the next best thing- pie! Like many, pumpkin pie is a staple at our holiday table. It's safe to say I've tried my hand at quite a few recipes, so today I'm sharing one of my family's favorites. Preheat oven to 450 degrees. Roll out crust and ease into 9-inch pie plate without stretching. Trim edges to 1/2 an inch over the edge and fold under. Crimp as desired. Cut any scraps into decorative shapes for embellishment later. Chill pie in the refrigerator for 15 minutes. While crust is chilling, make filling. Whisk together puree and sugars until smooth. Add cream, half and half and eggs and mix thoroughly. Whisk in pumpkin pie spice. 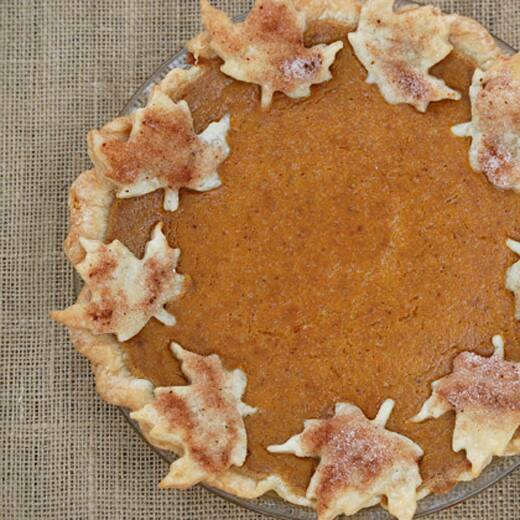 Remove crust from fridge and pour pumpkin mixture carefully into crust. Place in the middle rack of the oven and bake for 8 minutes. Reduce heat to 325 degrees and bake for 45-50 minutes more, or until the center is soft-set. It should still jiggle some and will continue to set as it cools. A knife inserted one inch from the crust should come out clean. May your holiday be yummy!